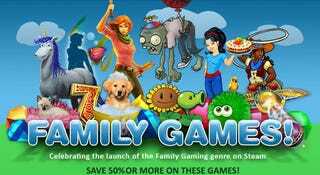 Valve announced on Friday the launch of the "Family Gaming" genre on their online store Steam, an entire new wing of the digital shopfront dedicated solely to games your mum, dad or gran might enjoy. Which means, yes, there's some horrible titles in there. But there are also many games that aren't horrible. The opposite of horrible. Excellent titles. Games like Peggle. And Plants vs Zombies. And some other games, many of which have been discounted (some by up to 50%) to celebrate the section's opening.